Join your favorite friends from Sesame Street in this interactive plug 'n play TV game. 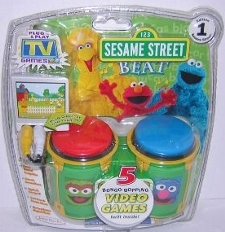 Contains five bongo-bopping video games, including: Elmo's Musical Trampoline, Grover's Dance-Mania, Big Bird's Farmyard, Zoe's Tour de Sesame Street, and Bert and Ernie's Magical Music. Plug it in your TV, add 4 AA batteries ( not included) and start the fun. The award-winning Plug It In & Play TV Games� products are gaming systems that contain multiple games in one single controller and featuring today's hottest videogame and entertainment licenses. All that is needed are batteries (4 AA not included) and a TV -- no videogame consoles are required. Simply plug the TV Games� unit into the A/V jacks of any standard television set, turn it on and play! The lightweight, compact, all-inclusive controller houses a combination of videogames with all of the hardware and software built right in. This technology allows gaming fans to enjoy a number of videogames with just one single purchase.